It’s not often you hear Ted Cruz support keeping a government research program alive when the administration wants to defund it and turn it over to the private sector, but that is what is happening with the International Space Station. And Cruz has a solid case. The administration announced earlier this year it wants to end direct funding to the space station by 2025 – three years ahead of schedule. Jim Bridenstine, the former congressman from Oklahoma who is now NASA administrator, said he is talking to companies about forming a consortium to operate the space station after the government funding runs out. NASA spends $3 billion to $4 billion a year to operate the space station in an international partnership that includes Russia, Japan, Canada and the European Space Agency. 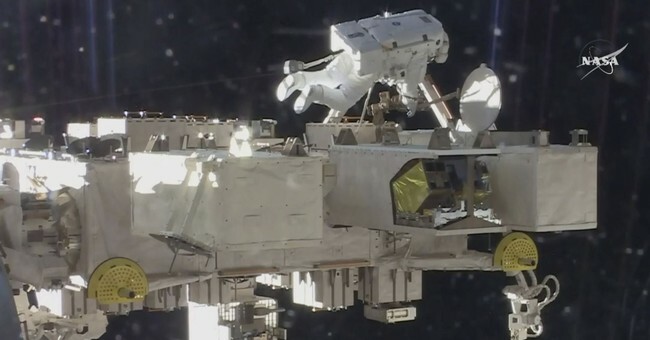 The International Space Station, the largest object humans have ever put into space, flies 250 miles above the Earth’s surface and has been inhabited by astronauts continuously since 2000. Astronauts study health and technology aboard the station with a focus now on how time in space affects humans with an eye toward deep-space exploration and long-term space occupation. It studies long-term changes to the body from being in space, such as why many of those who spend time there saying their eyesight is altered permanently. Technology research was key to espresso machines and 3D printers, among other products. Current plans call for the space station to be funded at least through 2024 with a proposal to extend it to 2028. After that, it could be de-orbited or recycled for future use. Cruz, the Republican senator from Texas, blamed the decision on “numskulls” in the Office of Management and Budget. He and others traced a variety of challenges that would come with the decision. First, Cruz is concerned no one will step up to partner with the government because of limited commercial opportunities and the complicated nature of joining a project that involves multiple national governments. Paul Martin, NASA’s Inspector General, shared Cruz’s concern about the commercial potential. Even if sufficient commercial interest existed, Martin said, NASA still would have to pay to use the station to complete research projects, including studies of how to transport humans into deep space. Martin said at least six of the 20 health risk research projects now going on and four of 40 technology research projects would not be completed before the government turned over control in 2024, as the proposal calls for. Frank Slazer, vice president of space systems for the Aerospace Industries Association, backed up the other point. Cruz has suggested something beyond science, commercial interests or even the perpetual conservative itch to privatize government may be afoot and that it is not worth courting a possible gap in US research capability to save what might amount to as little as $1 billion. He also said at a recent hearing on the topic that he opposes the administration initiative and intends to keep working for funding for the program. China, he noted, will have its own manned space station by 2022. Lawmakers are right to look for places where commercial interests can perform government functions and deliver government services. But they also are right to – as Cruz has in this case – carefully examine each idea to make sure it is appropriate. In this case, the administration doesn’t have a viable alternative to propose. It’s not even a given sufficient commercial opportunities exist. There is time to sort this out. And there is no reason to end funding now.